It's smallish, but so cute and clean-looking. I see the handy laundry corner in the reflection too! The light fitting is lovely - quite different for a bathroom. 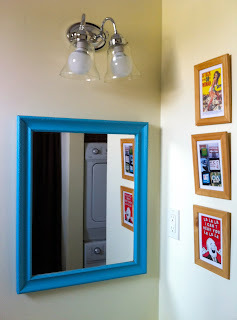 I re-painted an old blue mirror frame, with slightly pearlised deep red paint - it looks fab in our sitting room! Great minds think a like, I guess! The mini laundry machine might just be my favourite bit about my new place (sigh, I'm old).